The Franklin CDU-680 was released September 2007 and it has been the EVDO USB Modem that many people have been waiting for. The CDU-680 is around 1/3 the size of previous USB Modems (like the Novatel U720 or the Sierra AirCard 595U) and similar in size to the U727. In addition to its much smaller size, Franklin has added many new features not previously found on an EVDO USB modem. Windows XP/Vista, Mac OS X, Linux Connection Managers already loaded on installed flash drive (no need to carry a CD with you). Also Getting Started PDF Pre-Loaded on flash drive. The built-in 64mb flash drive isn't a lot of storage, but does include the connection manager installers for Windows XP, Vista (32 bit or 64 bit), Mac OS X and Linux. This is a pretty impressive use for the flash drive. You can walk up to almost any Windows, Mac or Linux computer with a USB port (any laptop or desktop) and have everything that you need to connect to Sprint's mobile broadband network. No need to carry a CD - in fact a CD is not even included in the package. The Franklin CDU-680 performs as well as the other EVDO Rev-A USB modems. During our initial testing, we were seeing speeds clocked below. 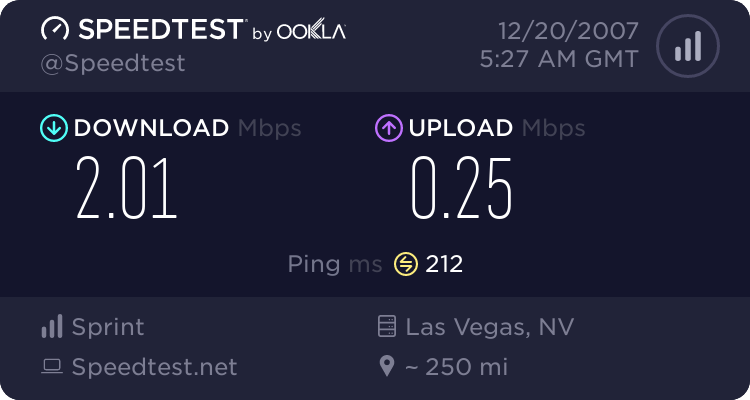 A Word About Speed Tests -- For our opinion on device speeds, please read this blogpost! Test results above, were all from exactly the same location, and all done within minutes of each other, on the same exact laptop. All USB devices gave identical signal stength readings. During our testings all devices performed similar in speeds - however, when doing speed tests, you may get different results with each test. For our opinion on device speeds, please read this blogpost! UPDATED 02/07/08: The CDU680 is compatibile with the Cradlepoint CTR350, PHS300 and the MBR1000 . The CDU-680 does not work in the Kyocera KR1 EVDO Router. For the latest on router compatibility, see our EVDO Router Compatibility Chart. Please note that the GUI support will only be available on Intel Based Macs (Not PowerBooks or other G3/G4/G5 PowerPC Macs - however, the modem will still work). After installing the Macintosh software from the flash drive onto Intel Macs and rebooting, the first thing that you will notice is the signal strength indicators in the menu bar. This may look VERY similar to the Apple WWAN drivers that Apple has built-in since Mac OS X 10.4.7, BUT it is not the same as it has many more features. UPDATE 02/20/08: Latest Software improves Signal Bar -- now features RSSI Signal! Pull down on the signal strength and you see the complete menu bar. Select 'Connect' and a few seconds later you are connected to Sprint's Mobile Broadband Network. This isn't a big deal for Windows users but for Mac users, this is BIG. The CDU-680 is a rare EVDO device that can undergo the first time activation completely on a Mac. With almost all other EVDO devices, Mac users would need a Windows computer or BootCamp to do the first time activations. Note: When purchasing your CDU-680 from 3Gstore.com, your CDU-680 will already come activated/tested and ready to use. A true 'first' for Mac OS X users is full GPS support. Again, Windows users have been enjoying 'Location Based Services' for some time now, but as is all too common, Mac users had been left behind. There is still no Mac OS X GPS support from Sierra, Novatel or Sprint. With the CDU-680, Intel Mac users wanting GPS/LBS can rejoice! From the pull down menu, select "Location and Search Services", and you can find places that are close to where you are located right now. In the screen below, I clicked "Find Nearest Gas Station" and within a few moments, a Google Map opens up and shows me my location and the location of all the closest gas stations. On the bottom of the CDU-680 is an external GPS antenna port. When one is made available, an external antenna should improve the GPS accuracy and give the GPS a clear view of the sky for certain applications. The included software also works on G3/G4/G5 Macs running OSX 10.4.7 or later. There is an extra step you have to follow to get it working correctly. Email support at 3Gstore dot com and we can give you the needed steps to make the Franklin CDU-680 to work on you PowerPC Mac (include your 3Gstore Invoice #). The CDU-680 is the first EVDO device to come with linux compatible software. While its not a full connection manager, it does allow you to connect to Sprint's EVDO network with only two simple commands. The device will then switch to modem mode and connect to Sprint's network. Franklin says this script is specifically for Ubuntu, however; I expect that it should work with the most popular distros of linux. Check back soon, as we will be testing the CDU-680 on some of the more popular flavors of linux. Franklin (of course) supports Windows. GPS is fully supported via Location Based Services. UPDATE! as of 11/20/08, we now have adapter cables for the CDU680 in stock at 3GStore.com. No available antenna adapter cable for the CDU-680. This means, today, you cannot add antennas and amplifiers to the CDU-680. However, 3Gstore.com is working to have an antenna adapter in the next few months at our store. In fact, we have a prototype of one that DOES WORK, since this is a new connector, it will take up to 8 weeks to get the initial delivery. UPDATE! as of 11/20/08, we now have adapter cables for the CDU680 in stock at 3GStore.com. No abiity to upgrade firmware natively on Mac OS X. If Franklin ever needs to upgrade the firmware, only the Windows connection manager can do the firmware upgrade, You can do this upgrade under BootCamp on an Intel based Mac. There is no signal strength (dBm) signal strength indicator when running under Mac OS X. When we add antennas and amplifiers , seeing the dBm number is a lot more important in adjusting antennas and amplifiers for best performance. Franklin has indicated they will add this in a future release. It is great having all your connection Managers for all OS's with you at all times. If you erase them, you can always download at Franklin's Support site. You have around 49MB left over on the flash drive for your files. Not a lot, but handy if you need it. For Mac Users, this is the EVDO modem you have been waiting for. First EVDO modem to support native Mac Activation "out of the box" for Sprint, first EVDO Modem to fully support GPS on Mac. The Franklin CDU-680 provides Mac OS software for Intel-based Macs only, however, it can work on older Macs. We think the USB form factor is a smart choice. The other 2 form factors are PCMCIA (a dying breed used in older laptops and EVDO routers) and ExpressCard (common on all newer laptops). When you start off with Sprint service, you are signing a 2 year contract. If you upgrade computers during those 2 years, you may have an imcompatible form factor with PCMCIA, however USB is on every laptop and desktop. Now that the size of the USB is so much smaller, it may be an attractive option for you.